The Competing Values Framework is a way of describing the different activities every organization needs to perform and how those activities conflict with each other. Take a look at this diagram, notice how activities on opposite sides of the diagram would tend to work against each other? It’s difficult to be creative and innovative (Entrepreneurial) while at the same time focusing on procedures and quality. It’s difficult to push for productivity and profits while at the same time paying attention to employee welfare and cooperation. Organizations need to do all of these things. Or rather, successful organizations need to do all of these things. The Competing Values Framework explains these conflicts and gives us a way to talk about them. 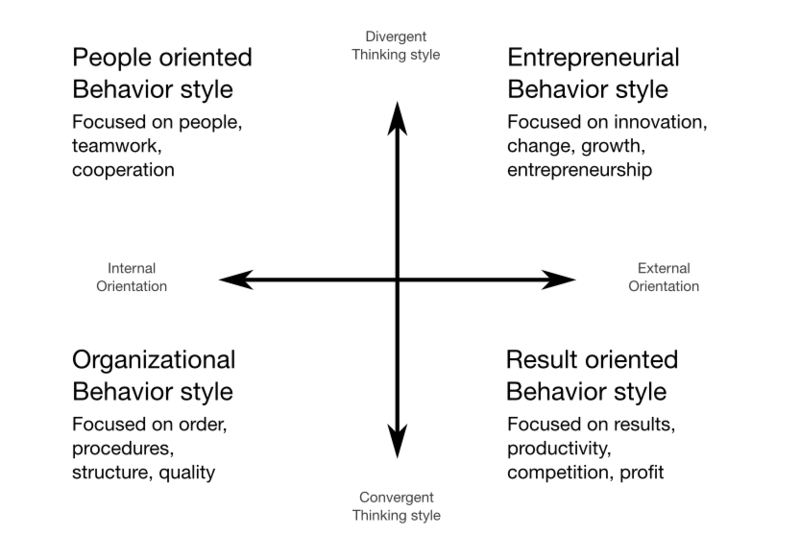 Since the early 1980’s, when this model was first proposed, it has been built on and used to describe organizational culture and work style. The Octogram was the first valid psychometric test to measure work styles in this model.